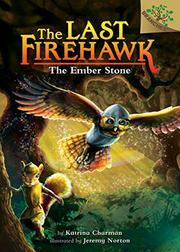 The first entry in the Last Firehawk series introduces the whimsical adventures of a brave little owl and his friends. In the land of Perodia, a dark Shadow encroaches on Valor Wood. The evil vulture Thorn (who, oddly, doesn’t appear in this first book though he’s mentioned in the introduction) controls The Shadow’s dark magic, aiming, for reasons unknown, to destroy the beautiful forest. Enter Tag, a small barn owl with big dreams. He longs to join the Owls of Valor, a group of warriors who protect Valor Wood from threats like Thorn and The Shadow. When Grey, their wise old leader, forbids all animals from entering the treacherous Howling Caves, Tag sees his chance to prove his bravery. Tag and his best pal, Skyla, a mischievous, slingshot-wielding girl squirrel, set off to investigate the caves, where they find a mysterious golden egg. Soon, the egg hatches the eponymous last firehawk, whom Tag names Blaze. Firehawks are magical birds, long thought extinct, who guard the Ember Stone against any who might use it for ill. Unfortunately, the Stone is broken and scattered about Perodia. Tag, Skyla, and Blaze must race to collect the Stone’s pieces before Thorn can get his vile talons on them and destroy the world. The black-and-white sketches depict Disney-esque, wide-eyed animals, while onomatopoeia pops off the page at regular intervals. The story is heavy on dialogue, with no shortage of exclamation points, keeping the energy level high and pages turning.